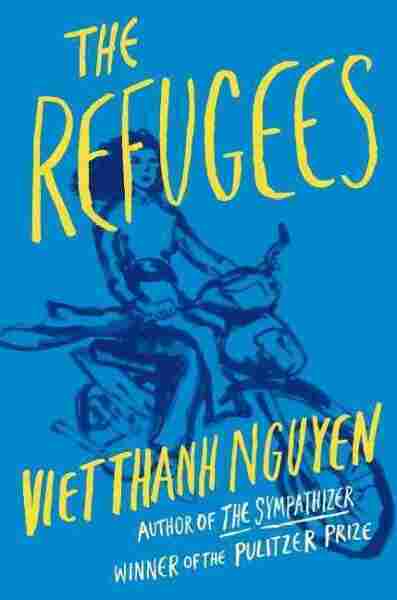 Book Review: 'The Refugees,' By Viet Thanh Nguyen Viet Thanh Nguyen's new collection looks at how it feels and what it means to be a refugee. It's a wonderful group of stories that prove fiction can do more than tell stories, it can bear witness. Even if you've read the news reports or seen the horrifying photographs, it's hard to fathom the terrible extent of the Syrian refugee crisis. The United States has accepted more than 10,000 Syrians fleeing the country's civil war, but that's a drop in the bucket — millions of Syrians have been forced out of their home country, hoping other nations will take them in. Some have, some have since closed the door. In his first short story collection, writer Viet Thanh Nguyen, who won the Pulitzer Prize in 2016 for his novel The Sympathizer, takes a look at how it feels and what it means to be a refugee. The characters in his stories are mainly Vietnamese citizens and their families, forced out of their country at the end of the Vietnam War, trying to make a home in a strange new land. It's a beautiful collection that deftly illustrates the experiences of the kinds of people our country has, until recently, welcomed with open arms. The book begins with the haunting "Black-Eyed Women," about a ghostwriter who lives with her mother; both were refugees from Vietnam. When the writer's mother mentions that she was visited by the ghost of her son, killed by pirates on the boat voyage to America, the writer wonders whether she might be on the verge of senility. But then she herself gets a visit from her brother's ghost, and realizes her lifelong struggle to forget him has always been doomed to fail. "More often ... I go hunting for the ghosts, something I can do without ever leaving home," she muses. "As they haunt our country, so do we haunt theirs. They are pallid creatures, more frightened of us than we are of them. That is why we see these shades so rarely, and why we must seek them out." Remembrance is a common theme in Nguyen's stories, particularly the kind of unwelcome memories that haunt the pasts of those who have endured trauma. In "The Americans," a married couple visit their daughter, who works as an English teacher in Saigon. The father has never been to Vietnam, apart from flying it as an American pilot in the war. And he feels ill at ease on Vietnamese soil, finding it hard to forget his actions during the war: "The tonnage fell far behind his B-52 after its release, and so he had never seen his own payload explode or even drop, although he watched other planes of his squadron scattering their black seed into the wind, leaving him to imagine what he would later see on film, the bombs exploding, footfalls of an invisible giant stomping the earth." It's a beautiful story about love, fear and loss, rendered perfectly by Nguyen. Every story in The Refugees succeeds on its own terms, but the most affecting one, perhaps, is "The Other Man," about an 18-year-old man named Liem who seeks refuge in America in 1975, after the fall of Saigon. He's taken in by a gay couple, immigrants themselves, one from England and one from Hong Kong. It's an urgent, wonderful collection that proves that fiction can be more than mere storytelling — it can bear witness to the lives of people who we can't afford to forget. Even as he makes a new life for himself in California, he finds himself beset by memories of his narrow escape from Vietnam. "As he lay on his cot and listened to children playing hide-and-seek in the alleys between the tents, he tried to forget the people who had clutched at the air as they fell into the river, some knocked down in the scramble, others shot in the back by desperate soldiers clearing a way for their own escape," Nguyen writes. "He tried to forget what he'd discovered, how little other lives mattered to him when his own was at stake." The Refugees comes at a time when Americans are being forced to reckon with what our country is becoming, what values we truly hold dear. It's hard not to feel for Nguyen's characters, many of whom have been dealt an unfathomably bad hand. But Nguyen never asks the reader to pity them; he wants us only to see them as human beings. And because of his wonderful writing, it's impossible not to do so. It's an urgent, wonderful collection that proves that fiction can be more than mere storytelling — it can bear witness to the lives of people who we can't afford to forget. As one of Nguyen's character reflects, "Stories are just things we fabricate, nothing more. We search for them in a world besides our own, then leave them here to be found, garments shed by ghosts."